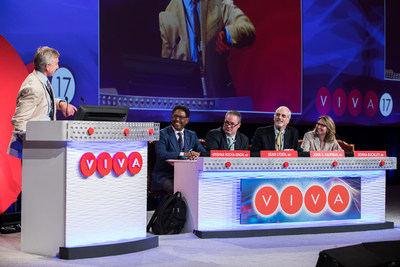 LAS VEGAS, Sept. 13, 2017 /PRNewswire-USNewswire/ -- VIVA Physicians, a not-for-profit organization dedicated to advancing the field of vascular medicine and intervention through education and research, announces the second five of twenty highly anticipated late-breaking clinical trial results at VIVA 17 hosted at the Wynn Las Vegas. Presented by Aloke Finn, M.D. Different combinations of carrier excipients and drug crystallinity unique to individual drug-coated balloons (DCBs) may influence embolic safety characteristics in peripheral vascular territories through embolization of released particulates. This has the potential to cause damage to nontarget tissues downstream of the treated area. A comparator study of three DCBs (3x dosing) in healthy swine was performed to assess the vascular response of the treated vessel and nontarget tissues (embolic effects) at 28 days. Paclitaxel was detected in downstream tissues for all DCBs and followed a similar trend. The ACT I clinical trial, a prospective, multicenter, randomized study to support the approval of the Xact rapid exchange carotid stent system (Abbott Vascular) in conjunction with Emboshield embolic protection systems (Abbott Vascular) in the treatment of standard carotid endarterectomy (CEA) risk, asymptomatic extracranial carotid atherosclerotic disease subjects. The current analysis evaluates the performance of carotid artery stenting (CAS) versus CEA out to 5 years in the subgroups of gender (212 women and 278 men) and different atherosclerotic disease burdens. Carotid plus coronary artery disease plus peripheral artery disease was the only subgroup in which patients treated with CAS versus CEA had a higher freedom from death, stroke, or myocardial infarction within 30 days or ipsilateral stroke between 31 days and 5 years and a higher freedom from ipsilateral stroke between 31 days and 5 years. In select subgroups of ACT I, CAS treatment resulted in fewer long-term clinical events at 5 years compared to CEA. Presented by John Laird, M.D. The phase 3 MOBILE multicenter study sought to determine if autologous bone marrow–derived progenitor cells (MarrowStim, Zimmer Biomet) could decrease major amputation in patients with critical limb ischemia (CLI). This is the first phase 3 trial in the United States to study bone marrow cell therapy for CLI. There were 152 patients enrolled at 24 sites. The rationale and design of this trial was based on a previous phase 1 trial and used a 3:1 treatment-to-placebo randomization scheme. At 24 months, 71 patients were eligible for analysis. Amputation-free survival was 73.6% in the MarrowStim arm and 50% in the control arm. Cell therapy appears to be durable through 24 months and improved amputation-free survival rates compared to placebo, although analysis is limited by sample size. The ILLUMENATE European trial was conducted to demonstrate the safety and effectiveness of the 0.035-inch Stellarex DCB (Spectranetics Corporation) for femoropopliteal revascularization. In total, 294 patients were randomized to treatment with the Stellarex DCB or an uncoated PTA balloon at 18 sites in Europe. Patients treated with the DCB maintained a significantly higher primary patency rate of 75.9% versus 61%. In conjunction with the higher patency rate, the rate of clinically driven target lesion revascularization was significantly lower in the DCB group (12.1% vs 30.5%). Functional outcomes, such as walking impairment questionnaire scores and walking distance, were similar between groups despite there being 60% fewer revascularizations in the DCB group. Presented by Mark L. Schermerhorn, M.D. This study compared gender-specific outcomes after endovascular aneurysm repair from a large global registry. There were 133 women (10.5%) and 1,130 men (89.5%) with infrarenal aneurysms treated with the Endurant stent graft (Medtronic) enrolled and followed clinically and radiographically. Women in the registry were older and had smaller aneurysms, narrower proximal aortic neck diameters, shorter nonaneurysmal aortic neck lengths, greater infrarenal angulation, and smaller bilateral iliac artery diameters. Successful delivery and deployment of the Endurant stent graft was achieved in equal numbers of women and men. Through 5 years, there were no aneurysm-related mortalities or ruptures in women; and the rate of freedom from secondary endovascular procedures was similar between the two genders (women, 85.6%; men, 84.1%). At 5 years, the combined rate of abdominal aortic aneurysm diameter stability and shrinkage was similar between genders (women, 89.6%; men, 89.4%).